Joe Marsh was taught classical piano from an early age taking examinations with the Royal Associated Board of Music. He then moved on to the church organ, at the same time gaining much experience in the technical aspects of organ building and tonal design when he and his father ( an ex-professional organ builder ) returned the Compton theatre pipe organ in the Odeon/Black’s Regal Theatre, Byker, Newcastle upon Tyne to prime condition. He was resident organist at this theatre from 1963 to 1969, broadcast the instrument for the BBC and played for all shows, intermissions etc until the organ was sold. He also appeared regularly at weekends playing the organs in the Odeon/Paramount and Essoldo Theatres, Newcastle upon Tyne and was relief minors organist at the Odeon/Black’s Regal Theatre, Gateshead from 1968 to 1975. Since then, Joe has played concerts all over the UK as well as several in the USA. He has various recordings to his credit and has broadcast many times on BBC Radio as well as on Radio Hilversum in Holland and a number of radio stations in Australia and the USA. He is a member of the Performing Right Society and has composed and had published a wide variety of music. Joe has also put together a number of silent film scores, some of which he has recorded on DVD and video using the Wurlitzer theatre pipe organ in the New Victoria Centre, Howden le Wear. These films have now been screened all over Europe and also many times on Satellite television. In addition, Joe has advised several venues in the UK and Australia on organ design, installation and tonal matters. Joe is also Chairman of The Theatre Organ Club, which is the oldest theatre organ group in the world having been formed in 1938 and still going strong. Joe was a member of the team that removed the Wurlitzer theatre pipe organ from the New Victoria/Gaumont Theatre, Bradford when the organ was bought by the North East Theatre Organ Association in 1968. He was deeply involved in the redesign, refurbishment and rebuilding of the Wurlitzer in the NETOA’s new home, the New Victoria Centre, Howden le Wear, and is a Trustee and Honorary Treasurer for the NETOA. Although highly experienced in all matters relating to organ building and tonal design/improvement Joe is, by profession, a qualified Chartered Accountant, a busy job which kept him away from the concert circuit for several years. He has now retired from the pressures of the financial world to enjoy his music full time with composing and performing. 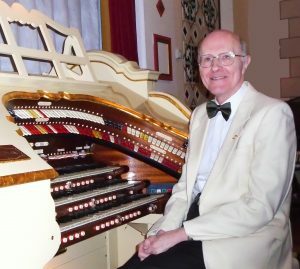 He is a very keen archivist and researcher of all things relating to the theatre organ and is a regular performer at theatre pipe organ venues around the country.